Swanton Morley is a large parish situated on the south bank of the River Wensum, 14km southeast of Fakenham. The parish has an area of 1109 hectares, and is home to around 2,500 people. The name ‘Swanton’ is derived from the Old English for herdsman’s enclosure, and ‘Morley’ refers to the fact that the parish was held by Robert de Morli in 1346. The oldest recorded objects are a number of Mesolithic flint flakes, spalls and retouched blades (NHER 30709) recovered from gravel. 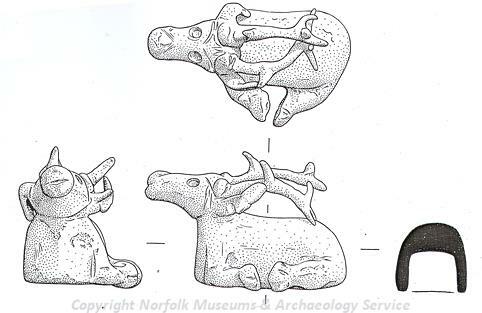 A Neolithic polished flint axehead (NHER 2989) and scraper (NHER 14020) have also been recovered, as well as a Bronze Age copper alloy axehead (NHER 15278). 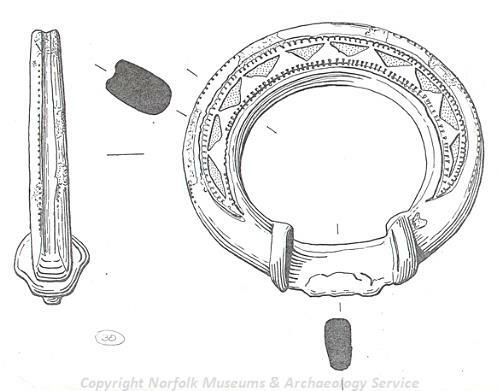 A small number of monuments of possible Bronze Age date have also been recorded, including ring ditches (NHER 12298 and 18309) and a circular pit and possible trackway (NHER 32197). Three examples of Iron Age metal work have also been recorded from this area, which is a surprising number. These comprise two enamelled harness pieces (NHER 33033 and 35700), as well as a horse bit (NHER 2990). The presence of these should be considered in the light of an early Roman military fort (NHER 17486), from which over twenty Iron Age objects have been recovered. 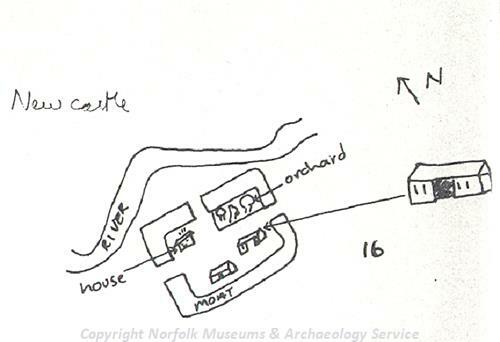 The fort itself (NHER 17486) is particularly interesting due to the high concentration of objects retrieved from the site that date to the early period of Roman occupation. The structure of the fort is the classic ‘playing card’ shape, with triple ditches and an entrance on the eastern side. Little is known about how many troops occupied the area, or for how long, but evidence suggests that the fort was in use during the time of the Boudican rebellion. Other Roman period monuments include two parallel ditches (NHER 3003) noted on the edge of a gravel quarry, one of which contained Iron Age and Roman pottery sherds. In addition some timber piles were recovered on the bank of the River Wensum, in conjunction with some Roman pottery sherds, and may represent the remains of a Roman bridge. A number of Roman period objects have also been recovered from areas outside these monuments. These include a number of coins (NHER 2994, 21008 and 21747), pottery sherds (NHER 2991, 3003, and 12299), and grinding stones (NHER 2992 and 2996), as well as objects such as brooches (NHER 28553 and 41352), horse harness fragments (NHER 36630) and a cauldron (NHER 2997). Although no objects or monuments dating to the Saxon period have been recorded, the parish is recorded in the Domesday Book. The parish appears well valued and populated, and mention is made of a church. 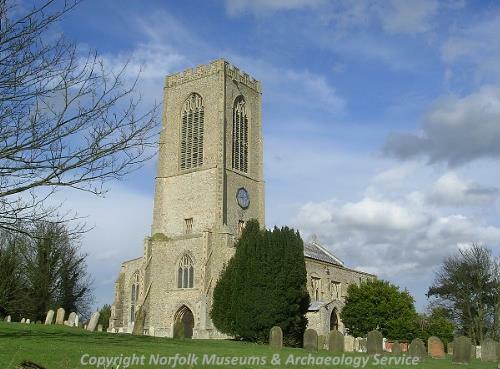 Today, the parish church is dedicated to All Saints (NHER 3014), and although no trace remains of any possible Saxon period building, the church is one of the earliest examples of the Perpendicular style in East Anglia. The massive tower has surprisingly long bell-openings, and inside is supported on large piers. The two other medieval sites are both moated features, one of which may have been the site of Morley Hall Manor during the medieval period (NHER 12300). The other is referred to as ‘Morley Castle’ (NHER 3008), a moated site on which post medieval structures are thought to have stood. A small number of medieval objects have also been discovered, and these include pottery sherds (NHER 3003 and 3004), coins (NHER 40126 and 41352), a copper alloy signet ring (NHER 13250), a decorated copper alloy strap swivel (NHER 31615) with animal heads, and a decorated fastener catch plate (NHER 32324). A small number of post medieval buildings of architectural interest also survive. These include the body of Swanton Morley mill (NHER 12586), which is known to have been in existence since before 1776, as well as nearby White Lodge (NHER 3012), an 18th to 19th century house of brick with a roof of pantiles. Near to this is a intriguing well house, which contains a medieval stone carving of a genuflecting angel. It is presumably from this that the Angel Inn gets its name (NHER 18610), the building itself dating to the 17th century and probably originally a timber-framed farmhouse. Also of note is Swanton Morley Airfield (NHER 2830), which was originally constructed for the RAF at the beginning of World War Two. During that time it included the largest grass airstrip in Europe, which survives to this day, and in 1942 the field saw the first joint British-American bombing raid. Associated with this are two spigot mortar emplacements (NHER 32440, NHER 32441), the later of which is situated in a weapons pit. http://en.wikipedia.org/w/index.php?title=Swanton_Morley&oldid=133400432. Accessed: 21 June 2007.